Over the past twenty years, presidential candidates have developed an entertainment talk show strategy in which they routinely chat with the likes of Oprah Winfrey, David Letterman, and Jon Stewart. In fact, between 1992 and 2012, there have been more than 200 candidate interviews on daytime and late night talk shows with nearly every presidential candidate—from long shot primary contender to major party nominee—hitting the talk show circuit at some point during the campaign. This book explores the development of the entertainment talk show strategy and assesses its impact on presidential campaigns. The chapters mix detailed narrative with extensive empirical data on audiences, content, viewer reaction, and press coverage to explain why candidates have embraced this strategy and the conditions under which these interviews are most likely to meet their expectations. The book also explores how these interviews can enhance campaigns by connecting a critical segment of the voting population with candidates who provide useful political information in a casual setting. Talk Show Campaigns shows that this is more than a gimmick—it’s a key part of how candidates communicate with voters, which reveals a lot about how campaigns have changed over the past two decades. "Talk Show Campaigns offers a fresh, comprehensive, and discerning examination of politics in the media age. For years even casual observers of American politics have noted an increasing number of TV talk show campaign appearances and now, thanks to Michael Parkin, we know why. 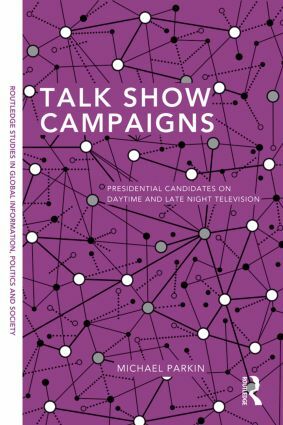 In this meticulously researched and captivating book, Parkin explores the relationship between political candidates and voters through the increasingly important structure of entertainment television. Through his examination of this talk show strategy, Parkin tells a larger story about American elections, the entertainment we enjoy, and the new ways that we get our information. Well written and accessible, this is a fantastic book." "This is a book that needed to be written. Over the past two decades, appearances on entertainment talk shows have played an increasingly important role in the campaign strategies of presidential candidates. While others have investigated this phenomenon, no study to date has offered such a comprehensive assessment of it over time. To do so, Parkin assembles an impressive array of data spanning over 200 appearances on entertainment talk shows by presidential candidates between 1992 and 2012, including content analyses of candidate interviews, audience demographics and ratings data. In bringing all of these elements together, Parkin is able to offer a thorough accounting of the role of entertainment talk shows in modern presidential politics. This book is a must read for students and scholars interested in presidential politics and political communication." 1. The Entertainment Talk Show Strategy. 2. Embracing the Talk Show Strategy. 3. Searching for Hard-to-Reach Voters. 4. More than a Forum for Lighthearted Banter. 5. Getting the Word Out and Going for Votes. 6. Generating Media Exposure. 7. Conclusion. Michael Parkin is Associate Professor of Politics at Oberlin College. His primary research and teaching interests are in candidate use of new media, particularly entertainment television and the Internet. International communication encompasses everything from one-to-one cross-cultural interactions to the global reach of the internet. The Routledge Studies in Global Information, Politics and Society celebrates – and embraces – this depth and breadth. To completely understand communication, it must be studied in concert with many factors, since, most often, it is the foundational principle on which other subjects rest. This series provides a publishing space for scholarship in the expansive, yet intersecting, categories of communication and information processes and other disciplines. Routledge Studies in Global Information, Politics and Society would like to publish work that educates readers about the complexities of international communication. We are especially interested in three areas: 1) research that focuses on empirical support for theoretical and conceptual development in communication and information processes, 2) research that is historically grounded and temporally expansive, and 3) research that is comparative and explores the world in both geopolitical and non-geopolitical categories. We welcome individual and co-authored manuscripts, as well as edited volumes.